Global Exhibition 2019 theme is about Global Community establishing a global action plan for the survival of life on our planet. 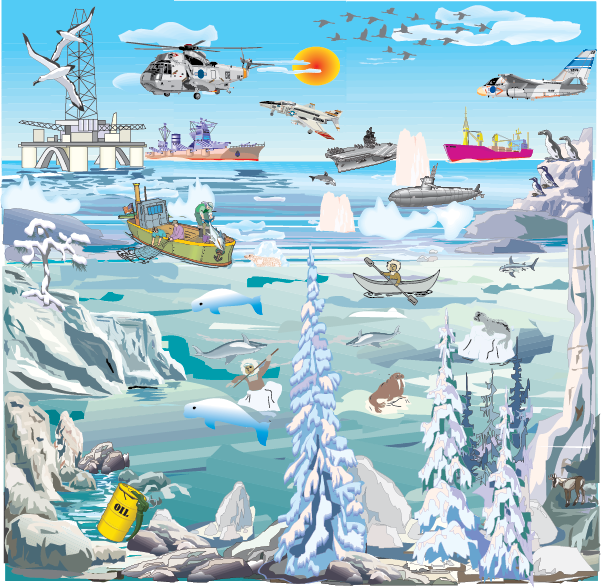 Letter to Donald John Trump, President of the United States, Vladimir Putin, President of Russia, Justin Trudeau, Prime Minister of Canada, concerning "Canada, the overseer, stewardship and custodianship of the Earth's north polar region. (A proposal of Global Community)" , from Germain Dufour, President of Global Government of North America (GGNA) . We are the first species on Earth that will have to limit itself for its own survival and that of all life. This picture was designed in 1985 by Germain Dufour, and represented at the time the vision of the world in 2024. The picture was all made of symbols. At the back is "the wall" where a group of people are making sure those coming in have been properly check out before being let in. 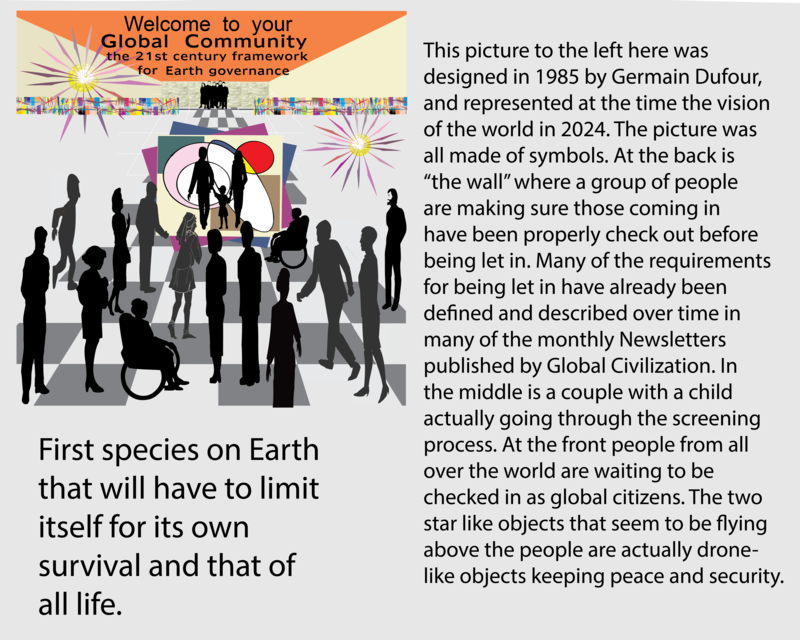 Many of the requirements for being let in have already been defined and described over time in many of the monthly Newsletters published by Global Civilization. In the middle is a couple with a child actually going through the screening process. At the front people from all over the world are waiting to be checked in as global citizens. The 2 star like objects that seem to be flying above the people are actually drone-like objects keeping peace and security. The animation, speech and paper for the theme. 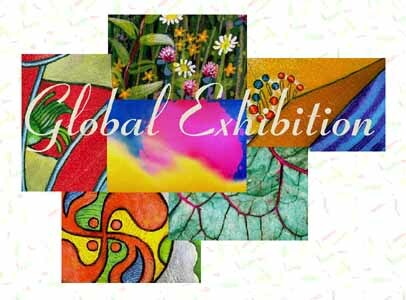 Global Exhibition is about Global Community establishing a global action plan for the survival of life on our planet. 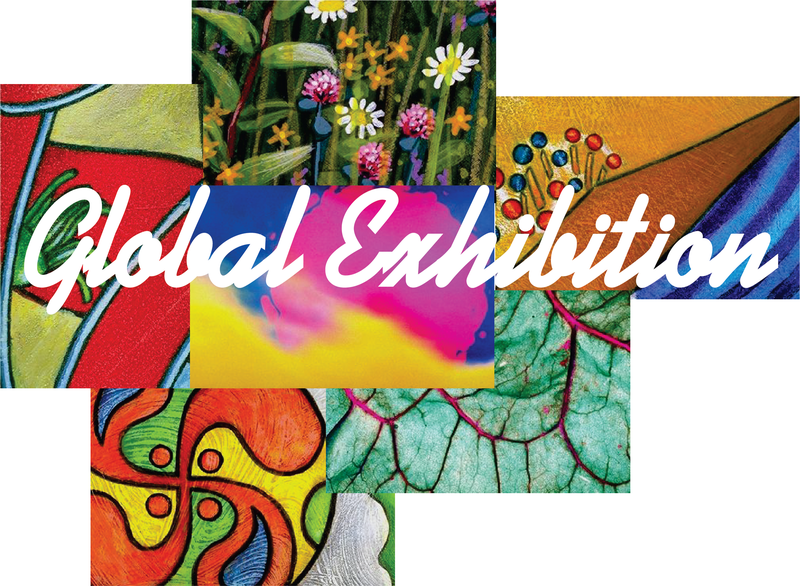 For the ninth year since the first time ever promoting of a Global Exhibition, there will be a Global Exhibition at the time of Global Dialogue 2019. It will also be occurring anywhere in the world along with Global Dialogue 2019. The Global Exhibition is a replacement to the usual Trade Show we have been promoting during each previous Global Dialogue. The Preliminary Program to the Global Exhibition will be the same as that of Global Dialogue 2019. Global Exhibition covers many aspects. It can be about creating high profile, highly targeted business and consumer exhibitions, where buyers and suppliers from around the world can come together to do business. In an increasingly digital age, nothing can replace the power of human contact for establishing and maintaining business relations. And with more market leading exhibitions than any other organiser, no organiser delivers more business contacts. We specialize in exhibitions, trade shows, conferences and event planning. Global Exhibition must allow multiplicity, diversity and contradiction to exist inside the structure of an exhibition ... a world where the conflicts of globalization are met by the romantic dreams of a new modernity, a new federation of nations, Global Community. We divide the Global Exhibition into "platforms" -- conferences and lecture series engaging figures from a wide range of disciplines -- that take place at different communities around the world over the course of the year leading up to the installation in a large Global Exhibition in one country. Getting to know one another and ourselves as one humanity. The Global Exhibition must allow multiplicity, diversity and contradiction to exist inside the structure of an exhibition ... a world where the conflicts of globalization are met by the romantic dreams of a new modernity, a federation of nations. 19. people are asked to produce any creative work (in arts, music, engineering, research, etc.) of their vision of what Global Community can accomplish. In this millennium, the affairs of humanity appeared to be unfolding in more profound ways. Cause and effect is now more apparent and happening more quickly. Those of you who are educated and aware will find themselves urgently called upon to action for the good of all humanity. Global link-ups are already happening at a fast rate. Business leaders are much more sensitive to the greater, wider needs for their expertise and are already in the process of creating a new kind of civilization. One of the most important factors in our lives is the inter-connection we have to others, to other countries. Through these connections you will be able to create changes for good on a global scale. We must now all become linked to others in faraway places on a much deeper level if we are to work together to keep our planet healthy, productive and hospitable for all people and living things. As your awareness of this global need deepens you will want to join with others to see that good changes happen. Right now you can use your skills, your knowledge, your abilities, to realize how your strengths can help bring about the best kind of changes in the world by connecting with us in our aim to promote sustainable development on four major levels: the land, the richness of our land, our economic endeavours and the welfare of all our peoples. We believe the world is at a turning point. We can no longer perceive ourselves as a People who could survive alone and a People who does not need anyone else. We belong and depend to a much larger group, that of the Global Community, the human family. The 21st Century will see limitless links and interrelationships within the Global Community. This third millennium is a new challenge. New standards, goals and objectives have to be defined. Firm universal guidelines are essentials in keeping the world healthy. Already we notice new ways of thinking being embraced, new behaviors and attitudes adopted. Global ethics are required to do business and deal with one another to sustain Earth. Indeed, we are becoming the Global Community made up of an infinite number of small units and Global Dialogue 2019 will bring us all together. Every human being lives within "a Global Community." This is his (her) global private community. One imagines he is inside a glass bubble ~ everything he can see from this glass bubble is his own "global community." Wherever we go, we are inside "a Global Community." Everything, every living creature there, interacts one upon the other. Influences inter-weave and are responsible for causes and effects. We are worlds within worlds orbiting in and out of one another's space, having their being. This interaction can be planned and executed in a caring, considerate manner so that all may exist and not destroy the other. The Global Community Assessment Centre (GCAC) is the centre whose objectives are to measure, assess, and integrate the interactions and present results to the Global Community. 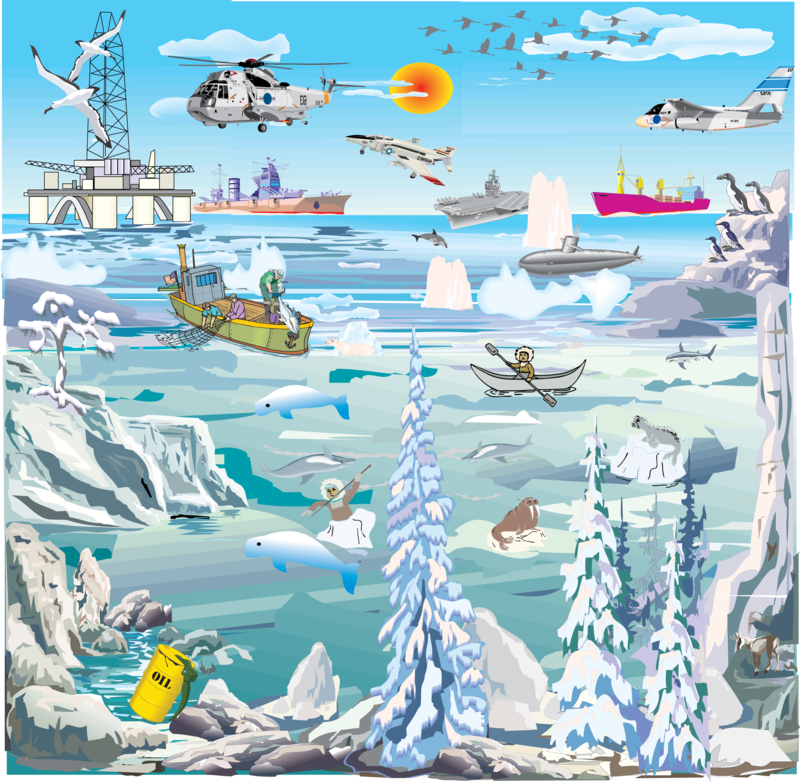 GCAC proposes a method based on fundamental principles, a sound science, and results are used to propose policies for management of global changes. Building global communities require understanding of global problems this generation is facing. There are several major problems: conflicts and wars, no tolerance and compassion for one another, world overpopulation, human activities critically endangering the survival of all life on our planet, as population increases the respect and value of a human life is in decline, insufficient protection and prevention for global health, scarcity of resources and drinking water, poverty, Fauna and Flora species disappearing at a fast rate, global warming and global climate change, global pollution, deforestation, permanent lost of the Earth's genetic heritage, and the destruction of the global life-support systems and the eco-systems of the planet. We need to build global communities for all life on the planet. We need to build global communities that will manage themselves with the understanding of the above problems. Perhaps the greatest change in our way of life will be the acceptance of the criteria to obtain the Global Community Citizenship. Every single human being must deal responsibly with the affairs going on in his (her) own "glass bubble" ~ when a person takes personal responsibility for his own affairs ~ he becomes empowered as a person. He can then reach beyond his own property and family, and help to work with others living in and around, even a part of the local community he lives in ~ the villages, the town community, the surrounding territory, and so on. The key is personal responsibility. Therefore the individual is the important element, one who takes responsibility for his community. This individual cares about jobs, homes, streets, the community. Controlling our overpopulated planet has now become a necessity. 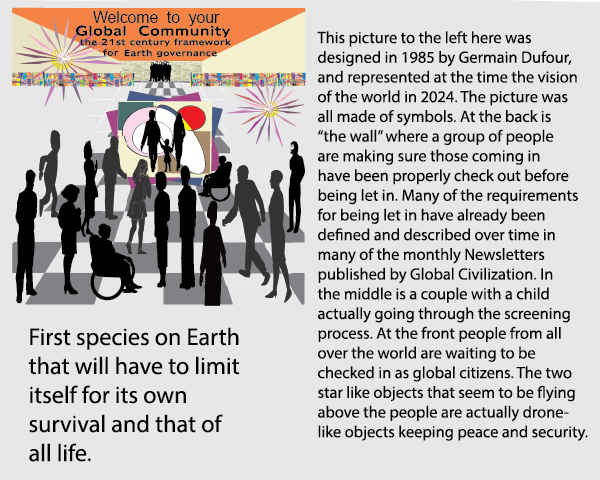 World overpopulation at the turning point requires each and every one of us to take a stand on rights and on being a part of Global Community, the human family. Today we are not asking women to have only one child as is done in China. No! First of all it does not work in China. Their population is still increasing. We are asking it to be socially acceptable for women to have the freedom of having or not having children. We are asking it for women to have the freedom to say no I dont want children, or yes I want to raise a family, and to make that socially acceptable. For this to work, women must also be given equal rights to men in every way. The Chinese family policy does not work because women are not given the freedom to choose for themselves and the equal rights to men. Women are 'persons' just like men. Those men and women who choose to raise a family of one or more children will be given support if needed. The effect of such change in our ways will be acceptance of being a part of the global community and that each one of us is doing things for the good of all. In this way, the heart, mind and spirit of the Global Community will be in the forefront of positive actions to ensure our survival. When a group of ordinary people realized they, personally, will make the changes they need in their fields, in their village. They can then find ways to bring these changes for all. There is a wisdom in the ways of very humble people that needs to be used. Every humble person deserves to have ideas respected, the courage to develop his own life for the better. Sound solutions to help manage and sustain Earth will very likely be found this way. Everyone can help assess the needs of the planet now ( measuring sustainable development ) and propose sound solutions for its proper management, present and future ( managing sustainable development ). Sound solutions to all our problems will have to be researched and developed and made available to everyone on the Internet. This is la raison d’être of the Global Community. Sound solutions made available to all Global Communities should insure a sound future for Earth. Exchange of creative solutions to the varied community problems around the world will benefit us all on many levels ~ socially, economically and ecologically. We can all help to manage Earth this way. We invite you to participate in Global Dialogue 2019 and its Global Exhibition to insure a sound future for Earth. What are the expectations from the Participants and Leaders of the Discussion Roundtables and Workshop Sessions? Copyright 2018 Global Community WebNet Ltd.